The Archbishop of Canterbury Justin Welby with the Ecumenical Patriarch Bartholomew in Istanbul on Friday. The Archbishop of Canterbury, Justin Welby, was in the Turkish capital Istanbul on Friday for a “cordial and informal” meeting with the Ecumenical Patriarch Bartholomew of Constantinople – the spiritual leader of the Orthodox Churches. The meeting took place as the International Commission for Anglican–Orthodox Theological Dialogue (ICAOTD) was concluding its annual week-long meeting in Cyprus. During their meeting, Archbishop Justin and Patriarch Bartholomew discussed the situation surrounding the Orthodox Church in Ukraine – a situation which resulted in the Dr Valentin Vassechko, from the Patriarchate of Moscow, unable to attend the ICAOTD meeting. Earlier this month, the Ecumenical Patriarch announced that the Holy and Sacred Synod had decided to grant autocephaly to the Church of Ukraine and to restore the “hierarchical or priestly rank” to the leaders of two non-Canonical Orthodox Churches in Ukraine. In the 1990s, as the Soviet Union broke up and Ukraine gained its independence, three competing Orthodox Churches emerged in the country: The official Ukrainian Orthodox Church (Moscow Patriarchate), and two independent Orthodox Churches: the Ukrainian Orthodox Church (Kiev Patriarchate) led by Patriarch Filaret Denisenko; and the Ukrainian Autocephalous Orthodox Church, led by Metropolitan Makariy Maletych. There had been growing demand in the country for the situation to be regularised and these increased following Russia’s invasion and annexation of the Crimean peninsula and parts of eastern Ukraine. But the Ecumenical Patriarch’s decision to do so has angered the Russian Orthodox Church. Its leader, Patriarch Kirill, announced last week that the Church was severing all relations with the Ecumenical Patriarchate. Today (Monday) his spokesman said that the Church would restore dialogue if Constantinople “recognises the fallaciousness of its actions and decisions and apologises for causing significant damage to the entire Orthodox world”, the Moscow Times reported. On Friday, Archbishop Justin and the Ecumenical Patriarch also “discussed the important issues of modern slavery, human trafficking and climate change – reaffirming their commitment to the dignity of all people and the importance of care for God’s creation”, the Lambeth Palace statement said. 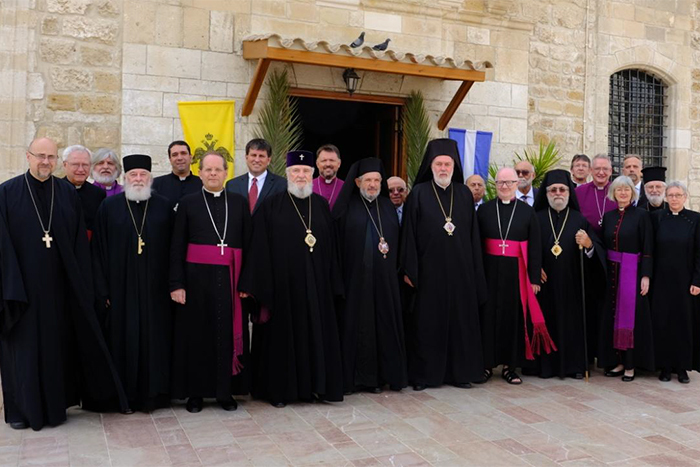 As the Archbishop and Patriarch were meeting, members of the ICAOTD ecumenical dialogue group were meeting in Larnaca. Underpinned by daily prayer and worship in both traditions, the Commission continued to develop its work on the theological understanding of the human person, according to principles in the document In the Image and Likeness of God: A Hope-Filled Anthropology, the agreed statement completed at Buffalo in 2015. Members of the International Commission for Anglican–Orthodox Theological Dialogue at their meeting in Larnaca, Cyprus, last week. “The focus this year was to further its work on the practical implications of the Buffalo Agreed Statement, for the complex and pressing issues surrounding the environment and ecology as well as the end of human life”, they said in their communiqué. “As agreed in Malta in 2017, first drafts of two agreed statements that addressed these issues were prepared by two members and reviewed by a small drafting group that met at the theological school on the holy island of Halki, Turkey, in June 2018”, they said. “The revised draft on the environment, Stewards of Creation: A Hope-filled Ecology, was discussed in plenary sessions where further critical reflections ensued in a constructive manner. “The Commission was gratified to find substantial convergence in our views on care for creation as well as opportunities for joint action. They expressed their sadness at “the ongoing pain and suffering caused by the occupation of the north of Cyprus and prayed for a speedy, just and peaceful resolution to this situation”, the Commission said. They will meet again in October 2019 in Canterbury, England. Click here to read the full communiqué (pdf).